On Sunday at 8:45 a.m. we have our Traditional service in our light-inspired, airy, glass and wood-prominent Sanctuary. This service features hymns and choruses accompanied by our pipe organ. The Asbury Celebration Choir sings at this service. You might also hear our bell choir or other special music. Pastor Dave shares a relevant message, and the entire service lasts approximately one hour. 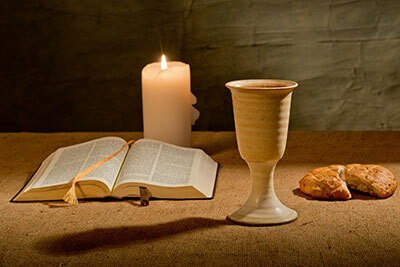 In Christianity, the basic meaning of the term communion is an especially close relationship of Christians, as individuals or as a church, with God and with other Christians. Communion is celebrated in a wide variety of ways, depending on the denomination and the customs of the individual church itself. This can lead to some trepidation when a person is visiting an unfamiliar church. At Asbury, we choose to celebrate communion in an open and inclusive manner. Simply put, our table is open to all who wish to partake. You do not have to be a member of our church, or any other church. You do not have to be a Methodist. There is no minimum age. If you prefer not to take part, that is okay as well. It is entirely your choice, and there is no pressure on you. If you choose to take part, and we hope that you do, the pastor always explains what we are doing beforehand and provides all of us with simple instructions. Communion is usually observed on the first Sunday of the month at Asbury.